The slogan for my blog, "creating memorable family reading experiences by celebrating children's author and illustrator birthdays" is something I think about as I prepare each birthday celebration. When I say "memorable," I most certainly mean that I strive for a "good" memory. Our celebration for Suse MacDonald almost was remembered for being a colossal failure. 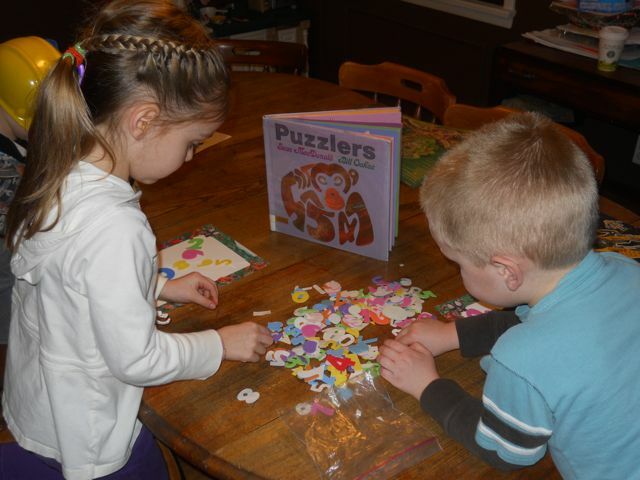 My original idea for an activity was just too difficult for my little ones. Luckily, we found another way to celebrate that had a more positive outcome. Suse MacDonald has written and/or illustrated 19 children's books including the 1987 Caldecott Honor book, Alphabatics. She said in an interview with California Readers, "I like working with paper. I usually do my books in collage. I like the feel of it. 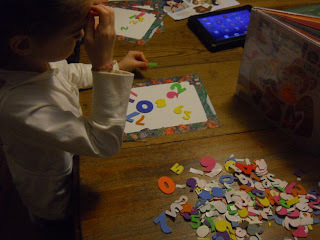 I can cut out the pieces for a whole illustration and arrange them before I have to commit by dry mounting them down." Early in her career, MacDonald worked as an illustrator of science text books. But, after attending two art schools, "her focus shifted and her work became less realistic and bolder and more colorful. It began to look like it belonged in a children's book." (susemacdonald.com). Right from the moment I acquired Suse MacDonald's books I knew I wanted my children to experience collage. 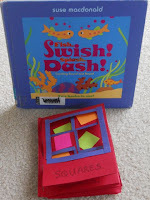 My youngest son was drawn to her book, Fish, Swish! Splash, Dash! : Counting Round and Round. I think he liked it because of the brightly colored fish and the cut-out pages that were fun to peek through. I appreciated the book because the cut-out pages were arranged in such a way that they created fish with beautiful markings. In the YouTube video below she said that the illustration idea for the book came by accident when, "I cut a fish out of colored paper and I had a pile of papers on my desk. Then, I went to answer the phone and put my cut out fish paper on the pile of papers. When I came back I saw that there was a design. I thought, 'wouldn't that be neat to have a book that is made up from the pages behind." I thought "it would be neat" to try to make my own cut-out book. I quickly realized that it is quite difficult to make a cut-out book. The biggest problem for me was that I didn't have the proper tools like an X-Acto knife or large scrapbooking paper punches. 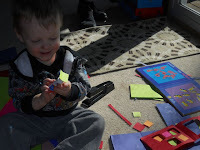 The second problem was that oldest son just wasn't into the idea of cutting out shapes to reveal things below. Oh well! 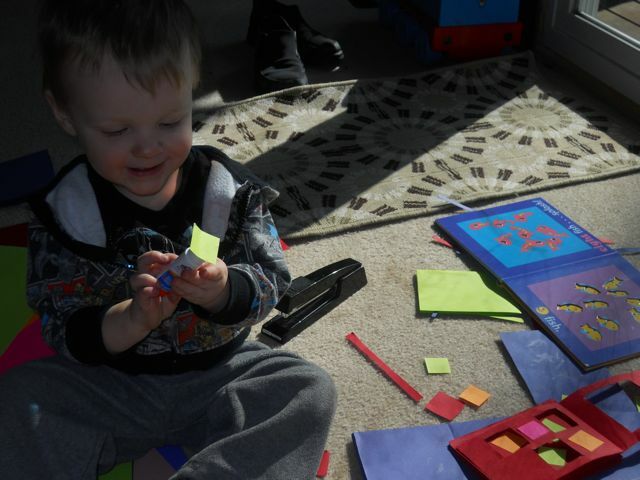 At least, my youngest son got some good practice at gluing shapes. If I have learned anything from writing this blog it would be that I can't control the outcome of the birthday celebrations. 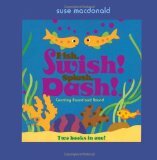 Thankfully, I was able to come up with an another idea to celebrate Suse MacDonald that provided a positive memorable reading experience for my children. 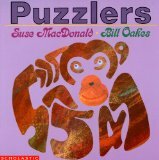 We read the book Puzzlers by Suse MacDonald and Bill Oakes. In this book a "colorful parade of animals" are illustrated with numbers of all shapes, sizes, and dimensions. 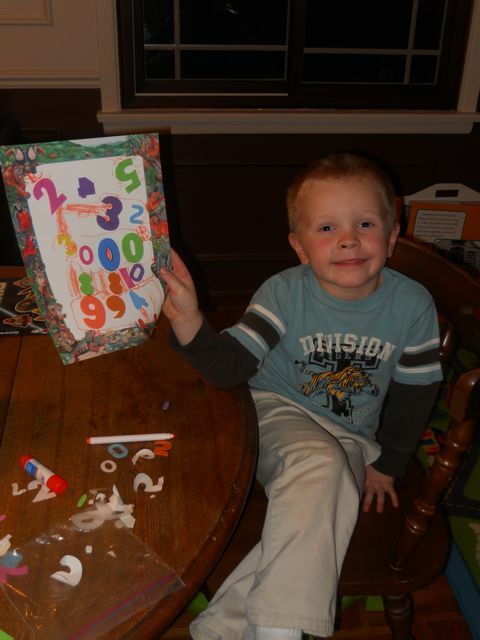 My kids loved looking for the stretched, pulled, flipped, and twisted numbers that brought each animal to life. 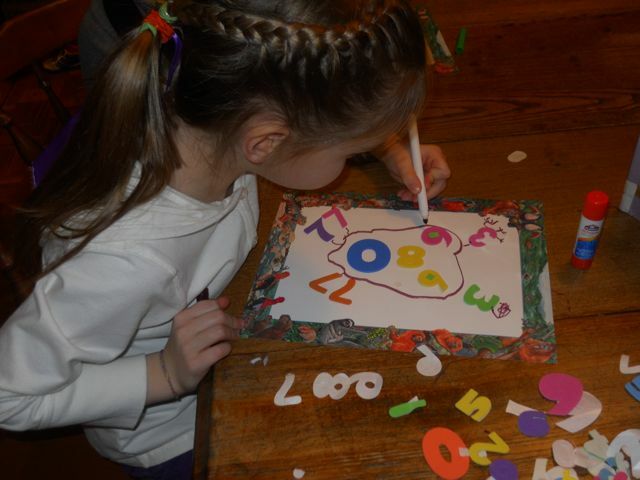 I gave each of my children a piece of blank paper and spread out a pile of foam number stickers. I told them I had a challenge for them, and they were instantly interested! 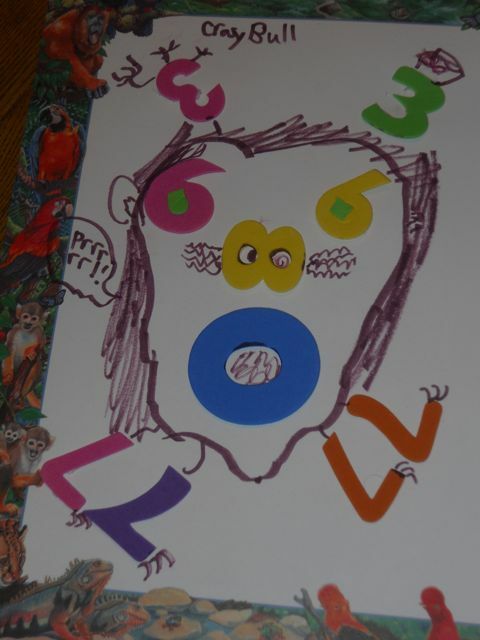 They were going to have five minutes to use the numbers to create an animal. At the end of the five minutes they would have one minute to adhere their stickers to the paper. The wheels in my daughter's head were really spinning! At the end of the five minutes of designing their collage and the one minute of adhering their numbers, I told them they could have one minute to add details with a marker. 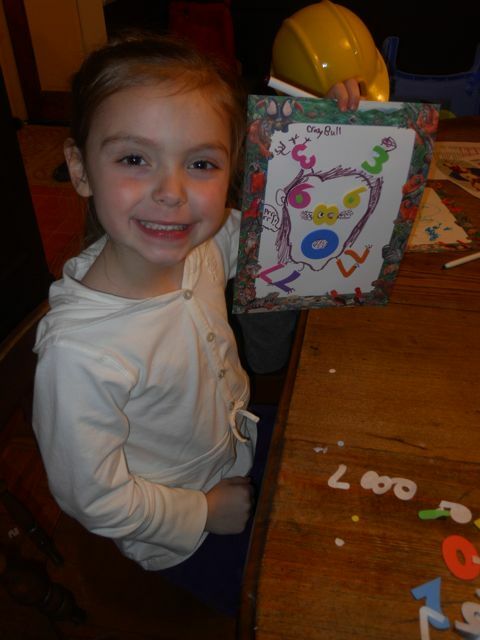 My daughter was very pleased with her "crazy bull". I was impressed that she used 3s for horns, upside-down 9s for eyes, a sideways 8 for a nose, a zero for a mouth, and 7s for legs! Here is a close-up. Watch out -- this bull is blowing steam out of its nose! My son said before he started the challenge, "I can't do this!" Yet, he was very proud of his moose! It was an adventure, but memories were created! Happy Birthday Suse MacDonald! We enjoyed reading your books this week! 4. Activity Guides from Suse MacDonald - Look Whooo's Counting, Alphabatics, Nanta's Lion, Sea Shapes + More available from her "For Educators" Page on her website. What, you don't have any scrapbook punches? Too funny. I also like how you've given controlling the outcome of the birthday celebrations. I have two boys, ages 5 and 3, so I can totally relate! Kirsten, before we moved our lovely neighbor would have been able to help us out with this craft with scrapbook punches! Miss her much! Learning to give up controlling the outcomes of things was a very important lesson that my children have taught me. Thanks! I will be over to check it out! Sometimes when my kids aren't in the mood, I end up doing crafts by myself. It's hit and miss, and some of my ideas are total failures... I like that you gave us two ideas today! I come to appreciate the failures too. At least we are trying, right? I so love how you share your failures and successes. Kids learn super lessons and can have good experiences from both... it's all part of life! I don't ever remember doing craft projects at home, I think I missed out a little. Thanks Joanna. I used to get so frustrated with failures, but I have found that you are right -- "super lessons" can be learned. We always remember the activities/birthday celebrations that do not go as planned!